Approaching the Castle of Clan Campbell, one first reached a sturdy guardhouse, made with great craftsmanship by the local stonemasons, that was overlooking the only easy passage entering the walled area around the Castle. The gates were usually open until the darkness started to fall over the land, but was guarded at all times by members of the Black Watch, with the presence of a ranking officer of the Watch or a Clan Member on duty to check the necessary papers and clarifications as to the reason of the visit. As you approach, you hear a petty officer of the guard shouting from the top of the tower. If your reason is important, you shall be allowed entrance. If you are English on the other hand, then...you don't frighten us, English pig-dogs! Go and boil your bottoms, son of a silly person! Ah blow my nose at you, you empty-headed animal food-trough wiper! Ah fart in your general direction! 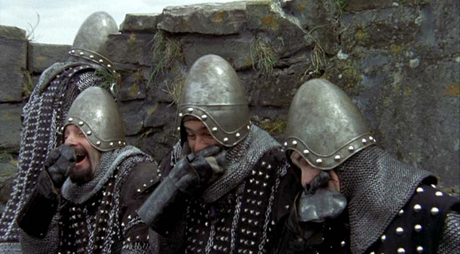 Your mother was a hamster, and your father smelt of elderberries! Now go away, or I shall taunt you a second time! Because being an enemy of Scotland would never make you welcome in the Campbell Castle, that was a knowledge common to all. I am Sean of the House Campbell. I am here for Milk and Cookies. I have come here because it was offered to me by Julius. He said I am a decent and trust worthy member of society. So as soon as I am done robbing and pillaging the people of England I will return to my home of Kirk. Welcome Kraven, nice to have you around if our mighty Chief in his vast wisdom and strong judgement has deemed you worthy. I am Evan T. Forbes - Campbell, Jack, proud member of this Clan and am here to uphold the rights and safety of Clan Campbell. To stand by my kinsmen with pride and honor in good times and bad. To serve my chief Julius Octavius in times of good and bad. To never harm a Clansman, verbally, physically, or their Public Reputation at any time, because our Reputation is the Clan's reputation. By being here, I give Clan Campbell my dedication, servitude, and my sword in any means necessary for the strength and growth of the Clan. I am here because I am a Campbell down to the blood and bones, now and until death takes me. Cheers Kraven!! Welcome, awesome and about time to see you here. Yes, Id like Kraven to be one of my squires. Aye!! I see good times ahead.. I think a good run of executions and man hunts clearing up Galloway before helping out our fellow Scots in Glasgow taking out the southern Scum..
My name is Shanor Murphy O'Neill (soon to be Campbell). My reason for being here is Sean. Welcome Shanor, I hope you find Clan Campbell comfortable, and as awesome as Sean. Sean runs to the gates, hearing his beloved is already here. He wraps his arms around her and kisses her cute nose gives her his arm as they walk past the gate and towards the Clan Castle.. I am An Munro Campbell, born Munro from the north, happily married to Xavierson for so many years now. We have a daughter called Haleigh. I am known for my honesty, my blunt way of speaking and for killing so many English in the Carlisle war. And I protect my family with my life. Aishling O'Niall, Aire ard of Clan Ó Néill, which means chief of the clan, Kingdom of Waterford, Shanor's distant cousin and friend. Here because of Shanor and Sean. I'm Snail, the owner of Snail Enterprises, I'm here to rip off... I mean trade with... I mean to say I'm here to enjoy the company of the Campbells. That's right. Yep, that's why I'm here. Well, that's not giving us very much information now is it? He is here as a potential trade contact for when we get things on the way in Scotland, to get if anything cheap in Ireland and to sell stuff in Scotland to sell in Ireland. Do not fetche la vache! Julius sent me to bang the coconuts around the castle! Hey,some known faces up there on the battlements! Hello, I am here to stalk the Campbell men and marvel in mutual greatness. Calico is Available if you are interested..
lol, we're a bit busy marveling on our own here..
Nah, kidding, its been a while, how've ya been? I am Cristiansens of the House Campbell. I'm here to serve you.